How To Get a Dofollow Backlink From Pinterest? As Page Rank update is nearing, all the webmasters are busy in creating Backlinks expecting that Google will award them with a precious Page Rank. One of the best ways of creating Backlinks is to link your website on different social networking platforms. It has become a trend because it is one of the easiest ways of building backlinks without any hesitation whatsoever. However, the only problem we discovered in most of Social networking website (including Facebook, Google plus and even twitter) is that they assign a nofollow attribution to external links. Therefore, it doesn’t pass the Page Rank Juice entirely. Keeping everything a Side, Pinterest has recently introduced a Verified website functionality that gives a Dofollow backlink to a certain website. Therefore, today we will learn How a Person can get a Dofollow backlink from Pinterest or How to verify your website on Pinterest. As we all know, Pinterest is among the pioneers of social networking website. No one could think of it that, within 1 Year it could beat some social giants. The reason behind its success is its uniqueness that literally amused everyone. 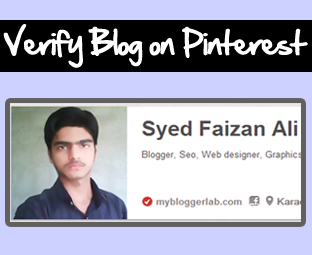 Following are the few reasons why a person should verify his website on Pinterest. Pinterest is a website with buckets full of authority. Therefore, by verifying our website we would receive a precious Dofollow backlink that is something extraordinary. After verification, it attaches a Verified sign to our domains, which gives a splendid impression to the followers. They have certain satisfaction that they aren’t wasting their time on fake or useless Pinterest pinboard. To be able to authenticate any website on Pinterest, first a person should have an account on Pinterest. If anyone hasn’t created an account yet, then go ahead and register a new one. After successfully registering our account, we have the liberty to verify our one website on that Account. Just follow the following instruction to learn how complete verification process. On the right side of the Screen, Hover over >> Your Pinterest Name >> and select Settings. Now scroll down and look for a Text area i.e. “Website”. Once you find it type your website URL and press the “Verify Website” button. (Remember: Type the URL of the website correctly because we have to upload an HTML file during verification). After pressing the Verify Website button, you will be redirect to a new page. Just like Google Webmaster tool Verification they will also provide an HTML File. Download that verification file upload it to the root (web server) of your website i.e mybloggerlab.com/pinterest.html. After uploading a verification file on the webserver of website, Press the “Click Here” button as mentioned in the screenshot below. All Done: Now visit your Pinterest profile and you will witness your website URL along with a verified icon next to it. To verify that they have given you a Dofollow Link view page source (CTRL+U) and search for website URL. There will be no attribution attached, so it means its dofollow targeted blank. We didn’t though that it would be so easy to get a Backlink from Pinterest. If a person has around 70 Active followers, then he will get a PR1 for sure on his profile. Getting quality backlinks from top quality websites always plays a key role in improving the SERP ranking. What are your thoughts about the new verification system? Please drop your precious comment. Take a lot care of yourself till then, Peace, Blessings and happy verifying. very nice post bro, i have already added my site to pinterest but not verify. please tell me how to upload file to blogger? Informative and useful post.The verification process is same like google webmasters tool i guess. but where to upload this file in my hosting :-? Upload it to the root (web server) of your website i.e mybloggerlab.com/pinterest.html. So many ads on your blog.I think you know it well that Google penguine is attacking on blog with to may ads. Are You Really Kidding! When I Think you are not. Any Ways Here's how it Goes. Penguin Algorithm: Is ONLY affact those websites that are busy in doing Black hat SEO or over optimize websites. It has nothing to do with ADS and etc. Page Layout Algorithm: It is the Algorithm update that concerns with the Page Layout and the advertisements on it. However, it have nothing to do with Number of Advertisements! It only affect those website which gives more importance to Advertisements than content. Those sites which displays tons of Advertisements above the Fold. For Blogger, meta tag is the best alternative to do this. Did you ever solve this? I also conducted a backlink test to my site and nothing from Pinterest shows up also!